Enter the path to the program you want to monitor in the first box on this page. You can also click on the [...] button next to the box and choose the Browse for file command from the menu to locate the file. In addition to the path to the program's file, you can also specify optional command line parameters. The parameters depend on the program you want to monitor. If you don't know which command line parameters to enter, leave the box empty. SoftDetective keeps track of the programs you were monitoring in the past, and you can select them for repeat monitoring from the drop-down list. Keep in mind, however, that when you choose a program to monitor in this way, only its path information is updated, it does not include the command line parameters that where in effect when the previous monitoring was performed. You may need to adjust the command line parameters accordingly. In addition to browsing for the program's file, SoftDetective lets you select a program from the Windows Uninstall list. This option is useful when you want to monitor the activity while uninstalling a program. (Use the second command on the menu after clicking on the [...] button and then select the desired program to uninstall from the list displayed.) When you do so, SoftDetective populates the path and the command line parameters for you. If you use Windows 7 or Vista, you can also use the Run as Administrator option, to control how you want to program to be launched. Most programs to be installed or uninstalled require to be launched with the Run as Administrator option checked. However, some programs may require this option to be cleared. If the monitoring does not work as expected or the program refuses to run, try changing the Run as Administrator option, and that may solve such a problem. 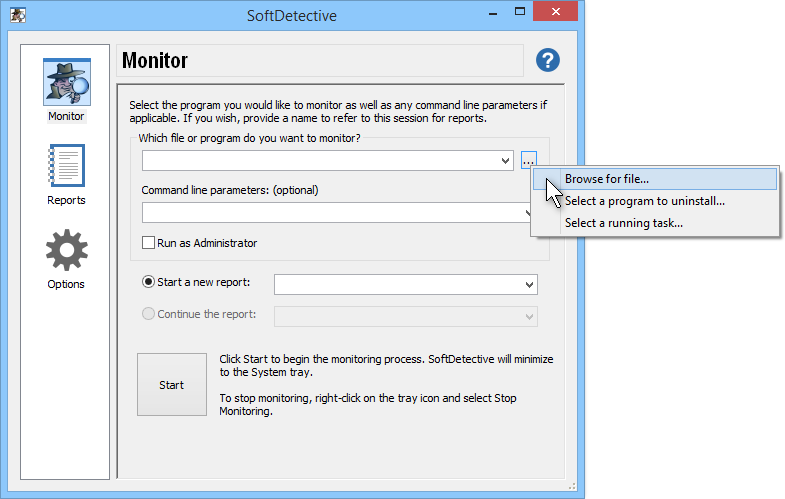 Yet another monitoring option offered by SoftDetective is the ability to monitor a program that has already started. This is achieved by the third command on the menu shown on the image above. If you choose the Select a running task command from the menu, the list of the currently running programs will be displayed, for you to choose the one you want to monitor. If you use this option, then the command line parameters and Run as Administrator options will NOT be used. Finally, you can optionally specify the name for the activity report to generate. If you leave the name empty, then the file name of the program (or the name of the task) will be used as the report name. SoftDetective will also automatically append the current date and time to the name of the report, to help you distinguish between different reports for the same program. Instead of starting a new report, you can also choose to continue one of the previously generated reports. This is useful, for example, if you want to see the results of installing and then uninstalling a program in one single report. During the monitoring, proceed with the program being monitored as usual: if it prompts you to enter the additional information, do so; if it needs you to press a button to proceed, press the button, and so on. While you work with the program, SoftDetective will keep working in the background, taking notes about the program's actions, the registry changes it makes, the files and folders that it creates, and so on. To stop the monitoring (for example, when the program being monitored has ended), double-click the notification icon of SoftDetective, or right-click it and choose the Stop monitoring command from the menu. After the monitoring is stopped, SoftDetective may take a few seconds to finalize the report. Finally, you can review the monitoring results on the Reports page of the SoftDetective window.